A test taker should carefully plan the days and weeks before their GMAT Test day including getting plenty of rest the night before, eating a healthy breakfast and allowing ample time to arrive at the testing center at least 30-minutes early. But this piece will cover the exam day for GMAT, before, during and after the exam is completed. What should one bring to the testing center for identity verification? Test takers should know that as soon as they arrive at the testing center the identification will be checked by testing agents. Before the exam all recipients will receive a confirmation email stating that each candidate should bring the following for identification. Make sure to select state, region and country as there is some variation in proof of identification from country to country. Government-issued national/state/province identity card (including European ID card). Include the order and placement of the names as provided during test registration. Have the Date of Birth match exactly the date provided during test registration. Please carry Appointment confirmation letter or email received from Pearson VUE. Be prepared and review the confirmation email carefully. Make sure the identification isn’t expired and that the photo on it is clear and all text is readable for the testing agents. What guidelines are necessary to know or do at the start of the exam? Exactly match the name, birth date, and country of citizenship that was provided by the candidate during test registration. Contain a recent, recognizable photo and signature of the candidate. Many test centers will take a digital palm vein pattern when a test taker initially enters the room and after any breaks. Often times a digital photo and signature are also required at sign-in. Arrive dressed in layers so one can take off or put on extra clothes if too hot or cold. Understand that arriving more than 15-minutes late may forfeit the opportunity to take the exam on that day and time. Know that drinking or eating is not permitted during the testing but do plan to bring a healthy snack and drink which can be accessed at one of the two scheduled short breaks (usually 5-8 minutes in duration). Weapons are not permitted in the testing room. Review the testing rules and agreement specific for the location where the exam is being conducted. No personal items such as phones, calculators or other technologies are allowed in the testing room. GMAC will send Official Score Report to up to five programs that are selected by the candidate at the test center prior to the start of the GMAT exam. The score reports will be sent electronically or by mail, depending on the programs ‘preferences. Candidates may ask to send official scores to as many additional programs as preferred. (fees apply), as long as the scores are not more than five years old. Aspirants will receive a copy of the following GMAT Test Taker Rules & Agreement at their respective test centers prior to taking the exam. In order to test, the aspirants must agree to comply with and be bound by the rules set forth in this Agreement. Everything aspirants do after signing this Agreement is part of the exam. If aspirants remain in the test area, he/she will be bound by this Agreement. Leave the test center immediately if he/she don’t agree to be bound by this Agreement and these rules. If aspirants need additional details about any of the rules or the expected conduct, please ask the test administrator for a copy of the GMAT Handbook. Many test centers have small lockers where aspirants can store the belongings. Whether that is the case or not, the test center is not responsible for lost, stolen, or misplaced personal items. Notify the administrator immediately if there is a problem with the computer, software, or any other issue. Testing will begin promptly once after seating at the computer. The length of the appointment is approximately four hours. Aspirants may leave the testing room or seat only if escorted by a certified test administrator. Aspirants must raise the hand for assistance or to leave the seat. Aspirants must return from breaks on time. If he/she are late, time will be deducted from the next section of the exam. Aspirants may not access any unauthorized items such as watches, study materials, or electronics such as cellphones. If he/she need to check the time while on break, Aspirants should ask a test administrator. Aspirants may not remain in the testing room at the workstation. Aspirants must take the break in the test center lobby, locker area, and/or nearest restroom. Aspirants are not allowed to leave the test center during this time. If Aspirants return from the break early and request to be checked into the exam, he/she must immediately begin the exam. Aspirants may not sit at the workstation for the remainder of the break. If Aspirants are found accessing prohibited items, his/her exam will be terminated, the scores will include a violation code, and other actions may be taken. Exam results are encrypted and transmitted to Pearson VUE and GMAC. The palm vein pattern template and the digital photograph may be compared against those of other test takers for fraud detection purposes. 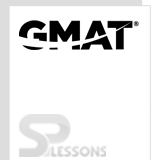 For additional information concerning the collection, transmission, and processing of your personal data (including, without limitation, exam results, palm vein pattern template, photograph and signature, and the audio/video recording), refer to the GMAC Privacy Statement available in the GMAT® Handbook and at mba.com. My test responses to the United States, which may be outside of the country in which I am testing. I understand the information provided above and agree to comply with and be bound by this GMAT Examination Testing Rules Agreement. I have read and I understand and agree to the procedures and rules I was shown when I checked in with the test administrator. I certify that I am the person whose name and address appear on the application check-in screen. I understand that the GMAT test is a confidential and secure test, protected by civil and criminal laws of the United States and elsewhere. I certify that I have not knowingly accessed “live” GMAT questions or answers that might appear on my test and will not discuss the content of the exam with anyone. I will not record, copy, or disclose any exam questions or answers, in whole or in part, in any form or by any means before, during, or after I take the GMAT exam (orally; in writing; in any Internet “chat room,” message board, or forum; by SMS or text; or otherwise). The test administrator may immediately dismiss me from the test session. My scores may be canceled without refund, and a school receiving my scores may be informed of the reason for the cancellation. I may be banned from retaking the GMAT test. I may be subject to other consequences, as GMAC or Pearson VUE deems appropriate. I understand that, after finishing the test, I will be prompted to decide whether to cancel or report my test scores. I understand and agree that if I do not select either the “Report Scores” or “Cancel Scores” option within the time allotted, my scores will be canceled automatically. I understand that if I do not agree to these conditions, I will not be permitted to take the test, and I will forfeit my test fee. Once the exam begins what are the best strategies for success? Check the computer and mouse assigned to ensure that it is working properly. If there is an issue, test takers should raise their hand for assistance. Be aware of where the clock is so test taker can keep track of time during the exam. Try to relax and be confident with the time committed to studying for this exam. Understand that the GMAT exam time is under 3.5 hours including the two optional breaks. If a test taker exceeds the time allotted for each break, then that time will be deducted from remaining test time. Test takers are not allowed to leave the room during timed sections of the exam. If you have an emergency raise your hand to notify the testing administrator but note that the clock will not stop for that timed section. Because the GMAT is a computer adaptive test, meaning the computer adjusts the next question based on the previous answer, do not skip questions. Answer them in the order that they appear on the computer. Test takers should use deductive reasoning if struggling with a question. Eliminate the answer that is known to be wrong, then 2 or 3 wrong answers if possible. Answer each and every question even if the test taker has no idea what the answer is they should apply their best guess. Read each question carefully and find an even pace through each section of the exam. You must store all types of electronic, communicative, or computer devices. You may not access or use them at any time (including breaks) after you check into the test center. Accessing Study Guides You must store all notes, study materials, or any other written material in your locker until you have completed your exam. You many not refer to these materials after check-in, including during your breaks. Storing Items Improperly You must store all items in your locker. Refrain from storing items in any other area, including bathrooms, the hall, emergency exits, etc. Any Other Unauthorized Item You may bring ONLY your identification, locker key, a light sweater, and prescription eyeglasses with you into the test room. Personal items including food, drink, and candy are not allowed in the testing room unless expressly pre-authorized for a disability. Disrupting Others (includes verbal altercations, lewd acts, and physical violence) You must act in a manner that does not disturb, interfere, or threaten other test takers or administrators. Falsifying Score Reports You may not alter or falsify an Unofficial or Official GMAT Score Report. Taking the Test for Others You must take the test for yourself. You may not test for anyone or have another person test for you. You also must not present tampered or altered identification. Disclosing Test Content Do not disclose, discuss, or access questions that come directly from a GMAT exam. Disclosing or accessing “live” questions from an exam in any format is prohibited before, during, or after the exam is administered. This includes, but is not limited to: online forums, blogs, discussion boards, test prep programs, test center communication books, etc. Providing Fraudulent Payment or Canceling Payments Using a fraudulent payment method to register for the GMAT exam is prohibited. You may not cancel a payment for any product or service received or ordered. Once the exam is finished what happens next? Test takers will immediately be given the opportunity to report or cancel their test scores. The testing center will allow test takers to view their unofficial scores, (Integrated Reasoning, Quantitative, Verbal and Total Score). Each recipient will be allowed two minutes to decide whether to accept the scores. If a test taker doesn’t decide within two minutes, the scores will be cancelled. A test taker is allowed to void their score at the testing center immediately, or, within 72-hours of finishing the exam for a fee of $25. Note that voided scores are not available on any scoring reports. Arrive at the exam knowing the ideal achieved score so the test taker can best strategize keeping or voiding their scores. Test scores can be reinstated online for up to four years and 11-months following completion of the exam. Decisions to reinstate an exam score will automatically be sent to the schools pre-selected for the GMAT by that test taker. Test takers of the GMAT should find confidence in the time and efforts spent studying for this exam while reviewing and being prepared for the rules and process of testing day. Following these simple guidelines will help assure the best possible results on testing day. The following happens based on the choice of the test taker/candidate. He/she has the option to cancel the accepted score online up to 72 hours after the completion of the exam. Scores can be canceled by logging into mba.com. The option to cancel the score may take up to 24 hours to appear, depending on the location of the test center. There is a fee to cancel scores after leaving the test center. Please refer to the fee table in the mba.com for the current fees. Candidates may reinstate a previously canceled score for a fee. Only exams taken on or after January 1, 2014, are eligible for reinstatement. To reinstate the score, candidates can log in to GMAT OFFICIAL WEBSITE. Candidates can refer to the fee table in the GMAT PRODUCT/SERVICE FEESfor the current fees.